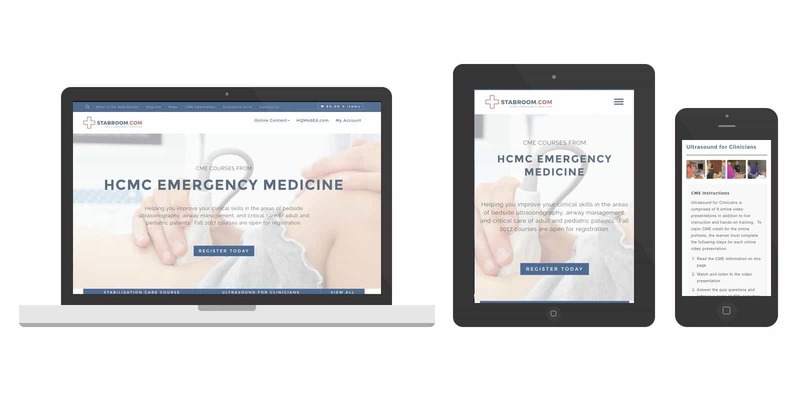 A subsidiary of HCMC Emergency Medicine, they offer a series of online classes to help improve clinical skills in the areas of bedside ultrasonography, airway management, and critical care of adult and pediatric patients..
Online classes made easy, styled beautifully. Stab Room (pronounced “steyb room”) approached Spark Logix Studios with a simple request. Make our site look better. Their design was out of date, they had content that needed to be refreshed, and they were just generally dissatisfied with the look and feel of their website. For their online courses, they use a WordPress plugin called Learn Dash. We were excited to dig in and learn how the system work, and how it connected to their WooCommerce plugin. We reskinned the entire site, upgrading to our custom framework, Respondo Pro. We then completely restyled the Learn Dash lessons, making for a more elegant and clean user experience while keeping the content they had spent so much time creating within the plugin. The client was extremely happy with the end result, and they were proud to show off the site as their new season of online courses began in 2017. Another fantastic e-commerce build from Spark Logix Studios, thanks to WooCommerce and our powerful Respondo framework!